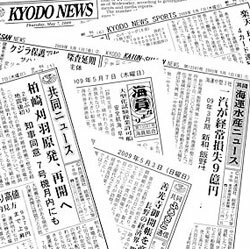 Kyodo issues newspapers, both in Japanese and English, that are radio-transmitted twice a day to about 800 ocean-going ships and fishing boats, and hotels in resorts abroad. First published in 1964, the newspapers marked the 30,000th edition in October 2007. It also offers Japanese-language news covering developments both at home and abroad to some 40 Japanese-language newspapers overseas.